Senior Kathryn Kidd works as an MU Sustainability Intern focusing her time and energy on coordinating TTR. As she gears up for this weekend’s third home game Kathryn explained that TTR provides the Columbia community with more than just an increase in recycling efforts at all MU home football games. Tiger Tailgate Recycling (TTR) is in full swing as the MU football season is heating up! Senior Kathryn Kidd works as an MU Sustainability Intern focusing her time and energy on coordinating TTR. As she gears up for this weekend’s third home game, Kathryn explained that TTR provides the Columbia community with more than just an increase in recycling efforts at all MU home football games. As the school year continues, the group of volunteers for TTR is continuing to grow. So far seven learning service students have been added to the TTR team (Service learning courses require students to serve a specific amount of hours at a location of their choosing). Kathryn explained that this is the largest group of service learning students she has seen since beginning her journey of managing TTR. Kathryn is also excited to welcome new volunteers from the community, staff, faculty and students who are not involved with the service learning curriculum. As she explained, this opportunity is open to the public and it’s a great way make a positive difference. TTR was started in 2005 as a Sustain Mizzou project before transitioning over to the MU Sustainability Office. 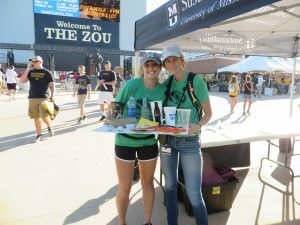 The partnership that MU Sustainability has built with MU Athletics has also allowed their office to offer free tickets into the home game after volunteers complete their shifts. Shifts are typically broken up into two separate two- to three-hour shifts prior to the game beginning. MU Sustainability is a proud supporter of a clean, sustainable environment and they are equally proud of the hard work all TTR volunteers have provided for Columbia, Missouri. For more information on how you can become involved in Tiger Tailgate Recycling, visit our website.